The digitisation of valuable materials from the St. St. Cyril and Methodius National Library collections started in 2006 and in the autumn of 2007 the scanned images became available for use on the website of the Library. A total of about 400,000 files were scanned and included in the Digital Library until the beginning of 2018 – manuscripts, old printed books, unpublished documents from the Oriental Department of the Bulgarian Historical Archive, portraits and photographs, graphical and cartographic publications, Bulgarian newspapers and journals from 1844 to 1944 – images and their metadata. A free access to the digital copies was provided to the users. The Digital Library encompasses several collections, organised according to the type and chronological scope of the included documents. The different collections are subdivided in sections. Correspondence as a type of document represents a significant share of every personal archive collection. Of the thousands of letters stored in the Bulgarian Historical Archive the following have been digitised so far: letters from HristoBotev, BotyoPetkov, Dr.PetarBeron, ZahariStoyanov, BoyanPenev, Vladimir Vasilev, TodorAleksandrov, PeyoYavorov, Dora Gabe, Lora Karavelova, Konstantin Konstantinov, Nikolay Liliev, Geo Milev, LyudmilStoyanov etc. The Bulgarian Historical Archive contains nearly 1 million various documents related to the life and activity of eminent persons from the Bulgarian Revival; cultural, social and state figures from the 18th to 21th centuries, Documents of the Bulgarian Central Revolutionary Committee and of GeorgiS. Rakovski have been digitised:Provisional law for the national rebel companies (1867), VasilLevski. Instruction of the Workers for the Liberation of the Bulgarian People (1871), the personal notebooks of VasilLevski (1871-1872), HristoBotev (1875-1876), P. K. Yavorov (1889-1914), as well as documents of the founder of the White Brotherhood Society PetarDeunov (1899). 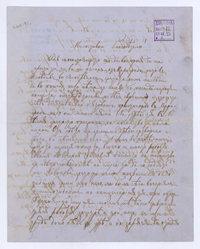 The entire archive collection of original documents of the renowned Bulgarian poet Geo Milev, has also been digitised. The Chronicles are books, compiled by church and school communities, artisan’s associations and individual rich merchants. They contain valuable information about the economic history, the struggle for an Independent church and the development of the Bulgarian society during the Bulgarian Revival. The Bulgarian Historical Archive contains more than 300 chronicles, mainly from the 19th century. The following have been digitised: Chronicle of the orthodox community in the town of EskiCuma (Targovishte) (1818-1882), Chronicle of the Bulgarian community in the town of Samokov (1875-1877), Chronicle of the tailoring and homespun tailoring association in the town of Dobrich (1857-1878). At the moment the Digital Library presents a part of the Portraits and Photographs collection and of the Portraits Collection of the Special Collections Department. 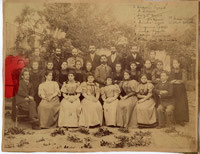 Among the digitised documents are portraits of Bulgarian and foreign political, economic, cultural and church figures, including photographs of their families, relatives and associates;photographs related to the Bulgarian Revival, modern history; photo views from Bulgarian cities, villages, historical places, memorial places related to certain persons and events, leading institutions; photo views from cities and towns in Europe and the United States. The collection of Bulgarian old printed books (1806-1878)contains about 1,700 books in about 10,000 volumes. It contains the printed works of the Bulgarian scholars from the National Revival period. The majority of the collection consists of liturgical and educational books, original and translated fiction. Of particular interest are the first editions of the writings of the prominent Bulgarian enlighteners and writers Sophronius of Vratsa, NeofitRilski, Dr.PetarBeron, P. R. Slaveykov, LyubenKaravelov, HristoBotev, IvanVazov etc. The materials of the collection will be digitised in chronological order.Among the digitised books are: KiriakodromionSirechNedelnik (1806) bySophronius of Vratsa, PovestRadi StrashnogoiVtaragoPrishestviya (1814), KnigaSiyaZovomayaOgledalo (1816), ChudesaPresv. Bogoroditsi (1817), RibenBukvar (1824) etc.To facilitate the consumers the description of the books includes the number under which they are listed in the repositoryBalgarskaVazrozhdenskaKnizhninabyDr.ManyoStoyanov. This collection of Slavonic Cyrillic old printed books contains editions from 14th to 20th century. 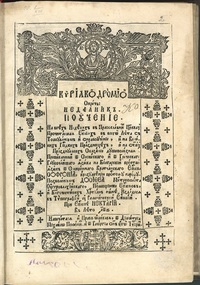 Some of these editions mark the beginning of the South Slavonic book-printing and particularly the Bulgarian book printing. The copies of books, printed in the first Slavonic printing-houses in Cetinje and Targovishte (Romania), are extremely valuable, as well as the editions of Venice from 16th century and especially those of the first Bulgarian printer YakovKraikov. Among the digitised documents of the collection are Chasoslovets (Horlogion) (Venice, 1566), Lament (Ostroh, 1603), Evangelion (Lviv, 1644), Akatisti s Kanoni (Akathists and Canons) (Kiev, 1765) etc. The collection of foreign old printed, rare and valuable books contains editions from 15th to 19th century, sorted by language.Many of them are bibliographical rarity and could enrich the holdings of every world library. The following books have been digitised so far: Dladziateknaukaczytaniapismapolskie (Кraków, 1611), Naukakuczytniupismapolskiego z figurmiprzyіozone so naboznemodlitwy y psalmy (Lviv, 1599), ElementariainstitutioLatinisermonis&pietatisChristianae (Кraków, 1575), PhotiiMyriobiblonsive Bibliotheca (Rouen, 1653), Historiography book (St. Petersburg, 1722). 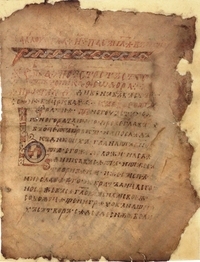 The collection of Slavonic manuscripts is the biggest one in Bulgaria and contains around 1 500 manuscripts and fragments, dating from 11th to 19th century. The documents that are predominantly digitised are those, for which the accessibility in digital format is essential, followed by the manuscripts of greatest interest for the scholars, as well as different fragments, the information about which could facilitate their identification as parts of manuscripts in other libraries and collections. Among the most important digitised manuscripts are: Enina Apostle from 11th century, Dobreisho Gospel from 13th century, Banitsa Gospel from 13th century, Pirdop Apostle from 13th century, SkopijeMenaion from 13th century. 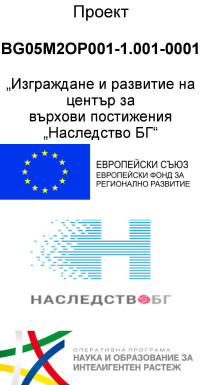 The major part of the presented manuscripts is available also through the EU digital platform Europeana. The fourteenth century was a time of high achievements of the Bulgarian written culture of the Middle Ages.Therefore it is known as the “Second Golden Age” of the Bulgarian literature. The collection includes manuscripts that illustrate this trend and show different aspects of the Bulgarian manuscript. The bilingual metadata of the digitised documents facilitates their search on Europeana. The National Library’s collection contains 150 Greek manuscripts, dated from 9th to 19th century, mainly liturgical books.The earliest manuscriptsand those of special interest to the readers have been digitised.Among the most valuable manuscripts of this collection are: decorated fragments of Gospels, 9th century, Prophetologion dated 12th century, Typicon, 14th century, Leitourgikon, 18th century, the Psalter miscellanies, 19th century. The collection “Other foreign manuscripts” contains 25 manuscripts in Latin, Romanian, German, Italian, Armenian and Georgian. The following manuscripts from the collection have been digitised: Regulation of the Bachkovo Monastery, which is very valuable for the Bulgarian history (copy from 1702) and Brief Grammar of the Bulgarian language from 1856, translated into Latin. This collection “Arabic manuscripts” includes nearly 3 200 manuscripts. Because of the big size of the collection, the process of digitisation will take a long time. Initially, earlier and rarely seenmanuscripts have been selected, covering a variety of topics:Kitab al-Yamini (OR K1) by al-Utbi (11th century) and Shakaik al-Numaniya(ОR 3367)/ history,Sahih al-Bukhari – copy from the beginning of the 11th century (OR 801) – hadiths, Sharh al-Luma, Grammar (OR 1863), Diwan of al-Mutanabbi (OR 2491) and Diwan Ibn Sabit (OR 2488) – poetry, Audah al-masalik (OR 2643) – geography, Miscellany of religious works (OR 492). 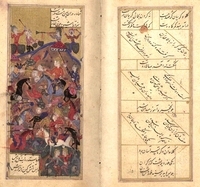 The collection “Turkish manuscripts” includes nearly 490 manuscripts. Several interesting titles among them have been digitised: a Bulgarian-Turkish dictionary compiled in Skopije – Lugat-it Bulgarî (OR 900), the biographies of saints Bahr el-velye, compiled in Kyustendil (OR 893) and Gyulshen-iinsha by al-Kastalani (15th century) in the field of epistolography. Along with documents about Bulgaria and other Balkan and European countries, hundreds of thousands of archival units are stored in the Oriental Collection, which contains valuable information about the Arab countries during the Ottoman period of their history.The political, military and economic relations of the Ottoman Empire with Iran explain the presence of archival documents about this country. The documents are written mostly in Ottoman Turkish, about 3000 – in Arabic and about 35 in Persian. They are organised into collections bearing the names of Arab and Iranian towns, regions and countries (Damascus, Aleppo, Beirut, Saïda Province, Hijaz, Cairo, Iran, Tabriz, Mosul, Baghdad, etc.). Information about these countries is also available in the OAC (Oriental Archival Collection), the First Collection (Istanbul) and some other collections.